The first signboard is placed at the St. Joachim Church. The trail then continues around the Svornost mine. 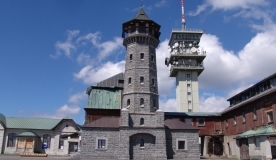 In the open-air mining museum you can see the exhibition of mining technique and have a look into a middle-age silver underground mine and a modern-day uranium underground mine opened for visitors. At every new stop, something interesting awaits you. The trail finishes at the Šlik castle where there is a beautiful view at Jáchymov and surrounding hills.